The building now called Tom Burke House at 153 Newcastle Street was constructed c.1897 as a terrace providing three prestigious dwellings. Although it is not known for certain who the architect was, one theory is that it was Louis Bowser Cumpston. Originally from Victoria, Cumpston came to Western Australia in 1891 to make the most of the opportunities here with the economy riding high on gold mining and a thriving building industry. In 1895, Cumpston married Daphne Nora Venn and in c1896/97 they purchased this land on Newcastle Street and built this terrace. At the time, this was a desirable address and highly attractive for investment purposes because of its proximity to the city and also the train. The Cumpstons lived in the residence at the eastern end (originally numbered 129 Newcastle Street) and rented out the other two residences (then numbered 131 and 133). However, they only lived in the house for about a year. The reason for them moving out was that by 1898 things had taken a rather sour turn with the Cumpstons’ marriage. After one of many heated arguments, they both shifted out and Daphne later took Cumpston to court on charges of larceny for having stolen her piano and other furniture. Then in 1899, Cumpston sought a dissolution of marriage on the grounds of Daphne having committed adultery. Both these legal actions were well reported in the local newspapers of the day. 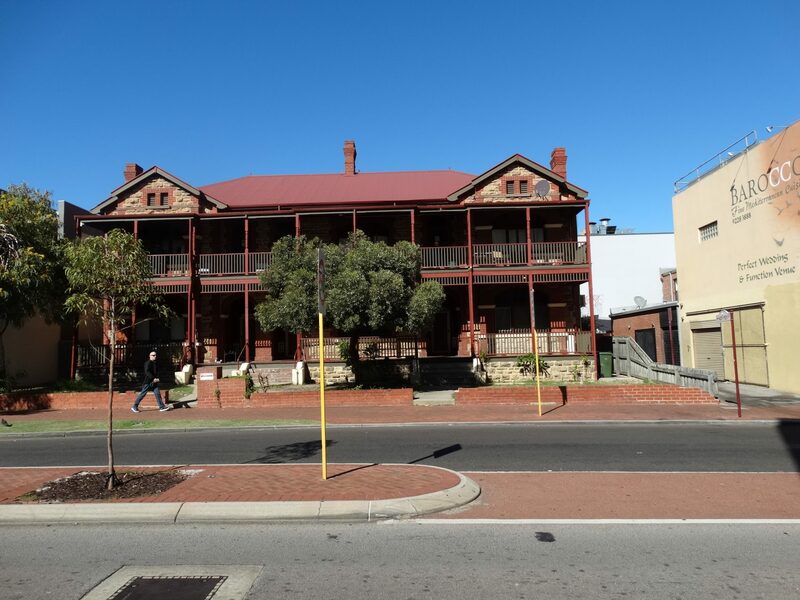 Daphne left Perth initially going to Melbourne then Sydney, although the Cumpstons were still settling property in 1901, including their terrace in Newcastle Street. By the 1930s, the three residences had been divided up further and converted into apartments (or flats) and later as cheap hostel-style accommodation. Fortunately, when a substantial part of Northbridge was assumed by the government to make way for the norther city by-pass and many buildings were being demolished, this handsome and rare 19th century terrace was retained including many of its original external and internal features. It was first named Tom Burke House in 1988, when it was opened by the Premier, the Hon. Peter Dowding, MLA for Homeswest then Perth Inner City Housing Association as a lodging house for men. The building now called Tom Burke House at 153 Newcastle Street was constructed c.1897 as a terrace providing three prestigious dwellings. When it was built, the terrace was numbered 129-133 Newcastle Street then by 1908 the numbering had changed to 191-195. Although it is not known for certain who the architect was, one theory is that it was Louis Bowser Cumpston. Cumpston was an architect and building surveyor and arrived from Victoria in 1891 to make the most of the opportunities here in the West with the economy riding high on gold mining. Cumpston had made a good living in Melbourne designing inexpensive housing, and after coming to WA he continued this endeavour, designing similar low-cost housing in East Perth and Northbridge as well as parts of West Perth. In 1895, Cumpston married Daphne Nora Venn and they first lived in Aberdeen Street (originally called Lamb Street up until 1897) in a residence called “Verona”. Cumpston and his wife then purchased the parcel of land at 129-133 Newcastle Street where they would build their new terrace in 1897. Being an architect, and having little money to his name, it is assumed that Louis Cumpston likely designed the terrace. By the mid-1890s, many houses as well as commercial premises were being erected along both sides of Newcastle street (originally called Ellen Street up until 1897) reflecting its growing popularity as a desirable address and highly attractive for investment purposes because of its proximity to the city and also the train. Wanted to let a handsomely-furnished two-storey Residence of nine rooms, complete in every respect, suit professional man or private family. Mrs Cumpston 129 Newcastle-st., three-doors from William st.
To Let, large Balconied House, 7 rooms, bath, pantry, copper and washhouse, new terrace, Newcastle st…Mr L Bowser Cumpston Newcastle st. It is possible that William Smith was the building contractor for the terrace as he was also the first resident of No.133 (later 195). The Cumpstons only lived at no. 129 for less than a year. The reason for them moving out was that by early 1898 things had taken a rather sour turn with the Cumpstons’ marriage. After one of many heated arguments Louise shifted out to a place on St Georges Terrace, and Daphne went to Melbourne having let out the residence with all its furniture to a Dr O Grenville Taffe. When she returned, Daphne accused her husband of having stolen her piano and other furniture from the house at 129 Newcastle Street, and the charges of larceny against Louis were heard in court in 1898 through to 1899. Later in 1899, Louis sought a dissolution of marriage on the grounds of Daphne having committed adultery which was proven. Both these legal actions were well reported in the local newspapers of the day. Daphne left Perth and moved to Sydney, although the Cumpstons were still settling property in 1901, including their terrrace in Newcastle Street which was purchased by Frederic D. North. North was Secretary to the then Premier Sir John Forrest and his brother-in-law, having married Margaret Forrest’s youngest sister Flora. North never actually lived in the residence and by 1903 it had transferred to Mr A. W. Wallder, a butcher, who also never lived there but next door at 125 Newcastle Street. However, the place stayed in the Wallder family for many years but only as a rental property. In the 1930s, in particular during the Depression, the creation of apartments or flats increased dramatically in the city of Perth and its immediate surrounds in order to provide more affordable housing for the many falling on hard times as well as the growing number of singles and couples wanting an alternative to single houses out in the suburbs. Initially flats were created through the conversion of large homes or two-storey residences such as those in Newcastle Street. Tom Burke House followed this trend, and each of the generous-sized single residences were converted into flats or apartments. Later the terrace became hostel-style accommodation as Northbridge started to gain popularity for lower socio-economic classes seeking cheap inner city accommodation and later for budget tourists. By the late 1950s and into the 1960s, a substantial part of Northbridge between Newcastle and Aberdeen Streets and Lord and Fitzgerald Streets, was gradually resumed by the government for the future development of a northern city by-pass. This included Tom Burke House. Uncertainty arose over the future of many of the former large residences built in the goldrush in the Northbridge area as many had become run down as low budget hostels. When the route for the northern by-pass was finally settled upon, Tom Burke House was one of few that would not be substantially affected and so was left, unlike many others that had to be demolished. The residence was converted into a Homeswest lodging house, with the official opening and naming of Tom Burke House taking place on 25 May, 1988, by the Premier, the Hon. Peter Dowding, MLA. The place was named after Thomas Patrick Burke in recognition of his involvement in community affairs, association with the Australian Labor Party, and contribution as Federal Member for Perth from 1943 to 1955. 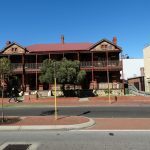 It remained in government ownership, and was again renovated in the 1990s after the Northbridge Tunnel was constructed and sub-leased to the Perth Inner City Housing Association as a lodging house for men. Even though it is no longer used as a private residence, Tom Burke House is still a handsome example of a 19th century terrace style residence having remained largely unaltered despite its change of use and when compared to so many other buildings in the Northbridge area. The façade still presents a handsome composition of limestone and red face brick with decorative rendered arches over the doors and windows, which is contrasted to the plain side and rear walls of red brick. Tall, red brick corbelled chimneys adorn the roof and a timber verandah featuring ornate, turned-timber posts runs the full width to both floors. Although from a general impression the façade appears symmetrical, the rhythm of the doors and windows along the front is asymmetrical indicating the layout of the three separate residences. The inside still contains some of the original ornamentation, with the main front rooms featuring elaborate plaster ceiling roses and plaster cornices, timber staircases with turned timber newel posts and balusters, and ornate carved timber and glazed tile fireplace mantles. Today, Tom Burke House represents the expansion and development of residential buildings in Perth from the time it was built in the height of the goldrush when the area north of the railway line was highly attractive for investment purposes because of its proximity to the city and also the train, through to the evolving composition of Northbridge’s population during 20th century. Gregory, J. and Taylor, R., ‘Slums of Tomorrow’ Architects, Builders and the Construction of Flats in Interwar Perth’, Studies in Western Australian History, Vol.XIV, 1992.